Lake Nosbonsing is a picturesque and popular fishing location, situated near the much larger Lake Nipissing. Located to the South of North Bay in Ontario, the lake is a product of the glacial outflow from the Great Lakes. At around 7 miles long, the lake covers an area of around 1600 acres. The lake is supplied by both Depot Creek and local springs and has the River Kaibuskong flowing out of the east and running into the River Mattawa. Nosbonsing is separated into two halves by narrows with both parts of the lake including several beautiful bays. Nosbonsing, located only a few miles from Highway 11, offers all of the fishing benefits of its larger neighbour, Lake Nipissing. It is much smaller, however, making it popular with less experienced fishing enthusiasts or those not wanting to deal with the vast expanse of water of Nippissing. Thousands of people visit the lake every year to take advantage of the great fishing that can be found. It is home to northern pike, white sucker, rock bass, pumpkinseed, cisco, yellow perch, smallmouth bass, walleye and muskellunge. 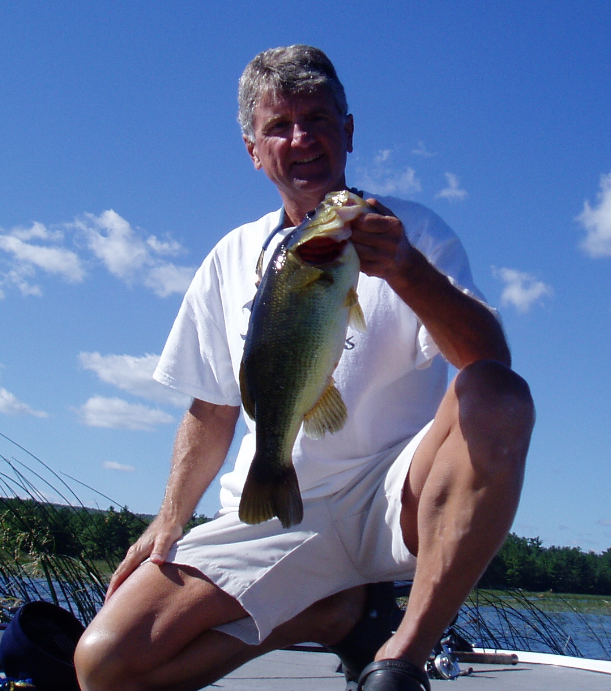 Walleye present the biggest challenge to anglers and are the main attraction to the lake. Birch Hill Camp is located on the north shore of Lake Nosbonsing, just 15 km from Callander Bay on Lake Nipissing and we can boast the fishing on our lake is getting better than the over fished other lake. We have Muskie and Northern Pike being caught annually that are close to record breaking in size. One example was a Muskie that was caught 10 years ago that put the scale at over 50 lbs. There are Pike tournaments every year, (a couple of them) with teams catching their limit and some that are over the 15lb range. We also have an excellent Walleye (pickeral) harvest every spring on minnows that are caught out of our lake, the Spot Tail Shiners spawn every spring and the Walleye are right behind them feeding on the minnows. There are about a dozen locations on the lake where you can catch your limit mornings and evenings for a 2 to 3 week period of time as the lake temperature warms up. After the lake hits 70 degrees the Walleye seem to prefer worms over minnows, and we tell our customers to find the weed beds and fish the edges of them, trolling at a very slow speed, and as the walleye are starting to feed again in July and August. Worm Harnesses or Jigs with a trailing hook are producing some great catches in the heat of summer. We have a good population of Perch that can be caught year-round, they seem to prefer minnows but can also be caught with worms. Pan fish are all over the lake and it seems where you have shallow weed beds you can find some great Rock Bass, Sunfish and if you stir up the water we are even catching Catfish. Small Mouth Bass can exceed 9 lbs in Lake Nosbonsing, and we also have Large Mouth now after they were introduced into this Lake 20 years ago. So, if your looking at catching a wide variety of fish species, Lake Nosbonsing is the lake you need to fish and Birch Hill Camp is the place to stay! We are bait harvesters so we always have live bait and we also sell Fishing Licenses, so if you visit us we can supply you with everything you need for a great fishing experience. A detailed Topographical map of the lake is also a gift from us to increase your odds of fishing. We will also point you in the right direction to the places that are producing fish at the time you are staying with us at Birch Hill Camp.